Do you prefer the look and feel of grass tennis courts? But don’t want the maintenance costs and other headaches associated with real-grass playing services? Then artificial grass is a very smart option. At Turf Green, we have specially designed and manufactured different types of artificial grass for tennis courts. These grasses have some great benefits for tennis court owners as well as players. Want quality artificial grass for tennis courts? There are a lot of artificial grasses out there on the market, but not many you’d actually want to use on a tennis court. If you opt for the cheapest artificial grass, this may save you a few dollars in the beginning, but from our experience this means you’ll be paying a lot more money down the track. Inferior products are appealing to a lot of people because of their price point. Unfortunately, though, what people don’t realise is that they may have to rip up the whole thing and replace it within 12-18 months once it starts deteriorating. However, with Turf Green artificial grasses you can rest assured that you’re buying the highest quality product on the market. We have careful quality controls at every step of the process—from design, to manufacturing to laying the grass itself. Our artificial grasses are made to last for decades. When we install our synthetic grass for your tennis court, it will look and feel much the same as real grass. In fact, our fake grasses offer a lot of benefits that real grass simply can’t match. Whether you run a public tennis court facility or have a private tennis court at home, our artificial grass surfaces can save you a lot of time and money. Our grasses are designed to deal with a lot of foot traffic, as well as the worst that Brisbane weather can throw at them—from scorching hot sunny days and high humidity, to tropical thunder storms and hail. Our Turf Green fake grasses also offer many benefits to those who use your tennis court—the players. built-in drainage capability so the surface is less slippery. All our grasses are made to comply with soft fall requirements, making them the safest surface to play on. And when it comes to sports like tennis, you want a surface that is going to protect you if and when you fall. This technology softens your fall and helps prevent injuries. If you’re interested in our range of artificial grass for your tennis court, contact Turf Green today. Or find out more information about our artificial grass installation, our supply and installation calculator or our DIY store. 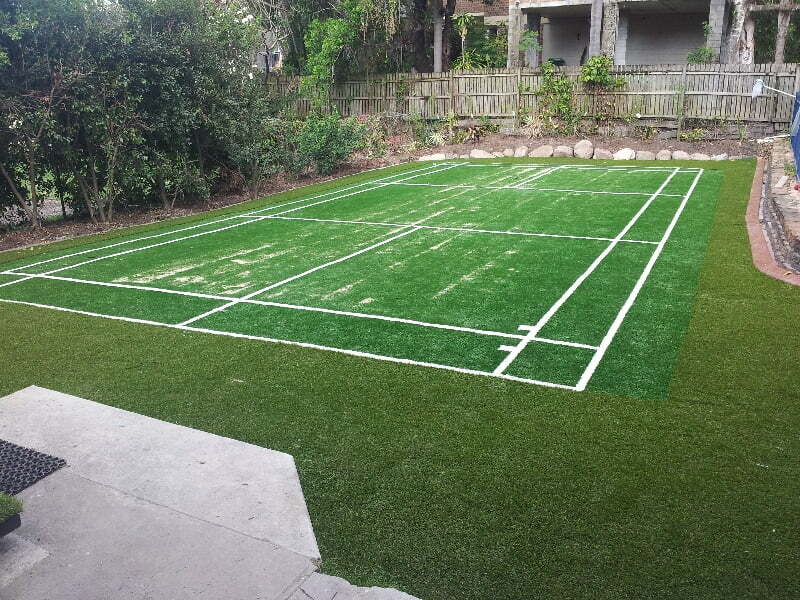 See a picture of an artificial grass tennis court we recently resurfaced for a homeowner.